We are dedicated to the advancement of education for our therapists and healthcare professionals. We are an accredited and approved continuing education provider for Physical Therapists, Occupational Therapists, Massage Therapists and Athletic Trainers. Since Athletico University’s inception, it has offered thousands of hours of free continuing education to our staff by top experts in the medical community. This cutting edge continuing education, in turn, has transferred into superior care for our patients and the communities we serve. It is our mission to continue to strive for clinical excellence providing our therapists and healthcare professionals with the educational tools to become experts in our field. 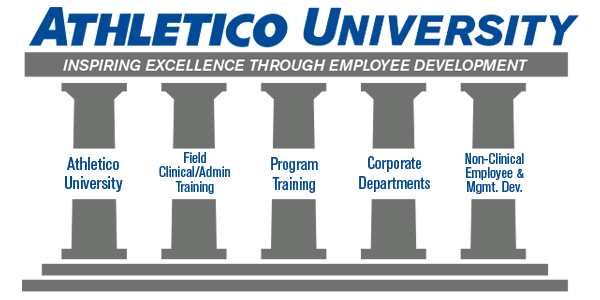 Athletico University’s sole purpose is to inspire the Athletico staff through our commitment to education, quality health care, and advancements within our field while integrating our unique services into our communities in order to better serve our patients. Advanced certification opportunities including but not limited to Orthopaedic Residency, Sports Residency, Manual Therapy Certification and Fellowship training with Evidence in Motion (EIM). Advanced certification opportunities including Certified Manual Physical Therapist, Certified Orthopaedic Manipulative Therapist and Fellowship training with the Institute of Manipulative Physiotherapy and Clinical Training (IMPACT). Athletico University provides more than 600 CEU Hour opportunities per year.